1. Direct air flow to the left or right, up or down. 2. Turn the knob to open or close the vent. Fan speed is adjusted automatically in accordance with the temperature setting and ambient conditions. As a result, the following may occur. fan may stop for a while until warm or cool air is ready to flow. • Cool air may flow to the area around the upper body when the heater is on. Recirculated air mode or outside air mode may be automatically switched in accordance with the temperature setting and the inside temperature. • In order to reduce the air conditioning power consumption, the air conditioning system may switch to recirculated air mode automatically. This may help to improve fuel consumption. 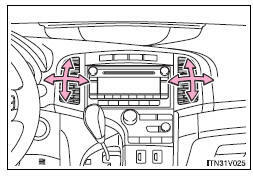 Recirculated air mode is selected as a default mode when the “ENGINE START STOP” switch is turned to IGNITION ON mode. 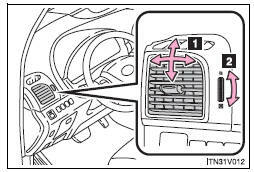 Recirculated air mode is selected as a default mode when the engine switch is turned to the “ON” position. • It is possible to switch to outside air mode at any time by pressing . 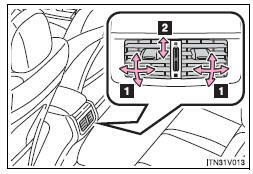 Recirculated air mode may automatically switch to outside air mode in situations where the windows need to be defogged. • During use, various odors from inside and outside the vehicle may enter into and accumulate in the air conditioning system. This may then cause odor to be emitted from the vents. • The start timing of the blower may be delayed for a short period of time immediately after the air conditioning system is started in the automatic mode. Air flows to the feet for a certain period of time when the air starts to flow. humid weather. The difference between the temperature of the outside air and that of the windshield can cause the outer surface of the windshield to fog up, blocking your vision.